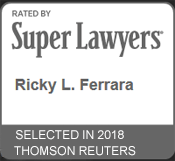 Home - The Law Office of Rick L. Ferrara, Esq. Thrive in a world of legal uncertainties by hiring the right lawyer. Your attorney should be able to operate precisely in a complex environment – not just be aggressive, but also smart; not just studious, but also creative; not only be correct, but convincing. When you arrive at the meeting, conference, or courthouse, bring the right representation. Finding the right fit starts here. Whether a business partner breached a contract with you, someone acted negligent and injured you, or someone intentionally caused harm to you or your property, you should call. Disputes happen all of the time. Get ahead of them with the right legal representation. Good contracts make for good business relationships. That means that with them, you have fewer disputes because the contracts are concise, clear, and negotiated to represent your interests. You need an attorney that has your business interests in mind for this to happen. But that’s not all. Your attorney must also be able to craft the contract you want, be able to see several steps in advance, and be savvy enough to show the other party to the contract that it is best for all parties. Defend against felony, OVI/DUI, drug, and misdemeanor charges with a smart, persuasive, and aggressive attorney. There is no case that is too small to handle. If you or a family member has lost at trial, start an appeal by calling today. Just because the trial verdict was not in your favor, that doesn’t mean that the outcome should have been that way. After conviction, there are many ways to change the outcome of a trial that was not fair. Learn more about who you will be working with you on your complex matter, and why your lawyer should be a well rounded, accessible, professional human being – not an automaton with a law degree. As a person seeking legal services, you need both a capable representative and a lawyer you can talk to on a regular basis for advice. That means your lawyer should be a person that you can reach, and who is capable of forming lasting, working relationships.